Residential Suites are offered for persons who enjoy the privacy and independence of their own residence, and do not require Personal Care services. All Residential Suites are located within our Farm Crest facility, providing convenient indoor access to service and recreation areas. 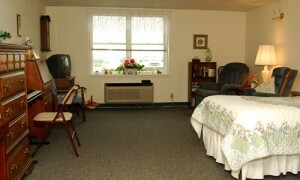 These spacious one room accommodations offer independent living with services. The daily rate for this level includes three daily meals, flat linen service, housekeeping, activities and 24-hour emergency response. Residential Suite residents manage their own medical care and transportation. Personal Laundry Service is available for an added fee. There is a monthly rental fee with no application or entrance fee. Residents have priority access to Personal Care, Rehabilitation Services and Health Care. Calls are made to the wait list when openings occur. Interested persons are encouraged to submit an application or call for more details.